There are several ways of decorating home but along with home, you need to pay attention at your table decoration as well. For fall, there are different ideas for stunning table decoration. You can make your table stunning for fall through some simple tips and ideas. For this purpose, you need to be creative because creativity is the only element that can give your decoration a natural look. Moreover, fall is associated with dullness so you can make your table stunning only through the accessories of bold colors. Want to know more ideas for stunning fall tables?? Continue reading. No thing can make your decoration appealing but thefresh flowers. You can place a medium size vase at the center of the table that has fresh flowers in it. The color of the vase should match the other accessories of present on the table. However, the colors of the flowers should be bright. You can opt for sunflowers or fresh roses as it will give your table a stunning fresh look in fall. If you’re not willing to put fresh flowers everyday then you can go for artificial flowers that have the same color attraction but not the fragrance. Try this idea for stunning fall tables. If you want to create a good impact of your fall display then you need to use contrasting colors. Put a vase of fine glass in different colors like blue, green, purple, orange etc. Don’t put flowers and try to compliment your vase decoration with fallcolor leaves. These rusty (artificial) leaves will look elegant on your stable and make a good sense of decoration indeed. The color of the leaves changes in fall so you need to keep that idea in mind and make your table decoration according to that idea. Take 2 to 3 small vases of transparent glass and fill them half with water. Now place small branches of leaves of different colors in them. It is the best idea for decoration which will look natural at the same time. For stunning look, you can add a center piece of some bold color so that it will add to the beauty of your table of fall. There is a huge variety of fall styles and you can make stunning fall tables by combining those styles. Place seasonal fruits like apple, pumpkins and also place flowers and napkin of bold colors. This is a casual and stunning fall table ready for you. Let your creativity come out and paint a large pumpkin with golden glitter paint. However you’re not confined to golden color only, you can choose any lively color of your choice. Make a big hole in the center of the pumpkin and place a beautiful candle in it. It is a good idea indeed that will make your table stunning for fall. You can also place some rose petals around the pumpkin as it will add to the beauty of your creativity. Give your table a fantastic look by decorating it with red berries. They came in different size and you can use a bunch of small berries place in a vase. Along with red berries, you can use color candles to enhance your decoration. This will make your fall table stunning and attractive. 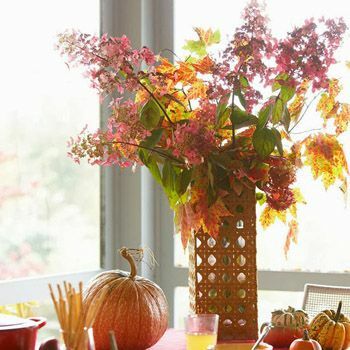 You can decorate your table for fall with elegant colors like orange and yellow. Orange candles at the corner of the table in a beautiful candle stand will make your table look festive. Yellow and orange tulips will add to the beauty of the decoration if placed on a proper place with proper arrangement. You can use the crockery of same color as it will compliment your candles and flower arrangement. These were the ideas for stunning fall tables. Hope it will make your fall like never before.